Students have the option of staying in the student residence hall, living in a homestay or sharing an apartment with another AIFS student. The Campus residence is situated on campus and houses both French and other international students. Many of the rooms have views overlooking the courtyard to the Mediterranean Sea. During the mid-semester break residence students are responsible for their own housing and meals. This is generally considered an opportunity to travel but you can choose to stay on campus and pay on site for the additional nights. Meals Residence students receive breakfast and lunch Monday through Friday and brunch on weekends in the Campus cafeteria. Living in a French homestay is a unique opportunity to immerse yourself in the language and culture of France. Some students find this aspect of the program the most challenging but also the most rewarding as you adjust and adapt to your new surroundings. All families are carefully selected and have to meet strict requirements and standards in order to host students. Homestay students stay in a double room that they will typically share with another AIFS student or international student. Single rooms can be requested for an additional fee. Meals Students opting to live with a homestay will receive breakfast every day in their homestay and lunch Monday to Friday and brunch at weekends in the campus cafeteria. The family will also provide a laundry wash and change of bed linen once a week. 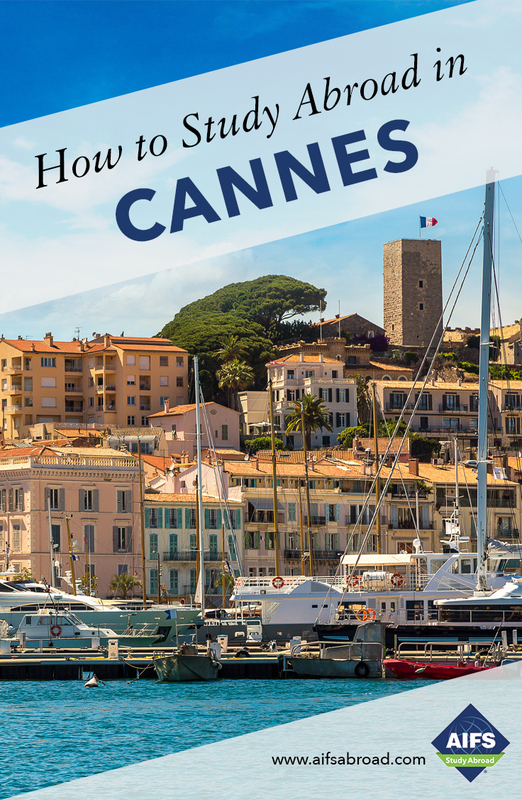 The number of host families in Cannes is limited so if you are interested in this unique opportunity please sign up as soon as possible in order to stand the best chance of being placed with a family. Housing in a centrally-located apartment. Students will be in double rooms with shared kitchen and living space giving you the freedom to cook your own meals. The number of apartments is limited so please sign up as soon as possible if you are interested in this housing option. Meals are not included. Once in Cannes, apartment students may select the Campus meal plan and eat lunch with their fellow students. Cannes’ sunny climate is ideal for outdoor activities such as swimming and sailing. You can also participate in team sports including basketball, soccer and volleyball. Spring semester students can ski at Isola, a 2-hour drive away. You can also take a French cuisine cooking course and a landscape drawing course for an additional fee to be paid on campus. You may be asked to pay a small supplementary fee for some activities and events. Provence has been a source of creative inspiration for some of the world’s greatest artists including Monet, Renoir, Cézanne, Gaugin, Van Gogh and Picasso. On the AIFS program in Cannes you will have the opportunity to visit museums dedicated to these artists and find out more about what drew them to this beautiful region. Spring semester students’ study abroad experience coincides with the world famous Cannes Film Festival which runs for 2 weeks in May. Students receive a ‘Cannes cinéphile’ pass which entitles them to see all the films presented at the Film Festival in different movie theaters throughout the city. Students may also volunteer to work at the exclusive dinner gala organized by amfAR (American Foundation for AIDS research) which is attended by many Hollywood celebrities and famous names from the world of fashion, music and business. On occasion students have also had the chance to walk the famous red carpet. This is a once-in-a-lifetime opportunity for students seeking careers in communications, public relations or the arts. Bonjour! I am a native of Cannes, and became the AIFS Resident Director here in 1999. I studied abroad for a year in England, a year in Spain and a third year in Scotland, encountering new adventures and challenges every day. It really changed me as a person and altered my perception of the world. Along with traveling I enjoy discovering new cultures. I speak French, English, Spanish and conversational Italian. I have a Masters degree in Tourism Management and have worked in the tourism industry in Greece, Norway, Tunisia and Ireland. Whether it's your first time abroad or your tenth time, every minute is sure to be a great experience. I look forward to helping you adjust to the new environment and sharing my culture with you. A très bientôt à Cannes!